Hi everyone! Wanted to share my latest cd class with you all. It took several tries but it finally came together and the Prima Nature Garden collection of papers and embellishments were the perfect choice for this project. 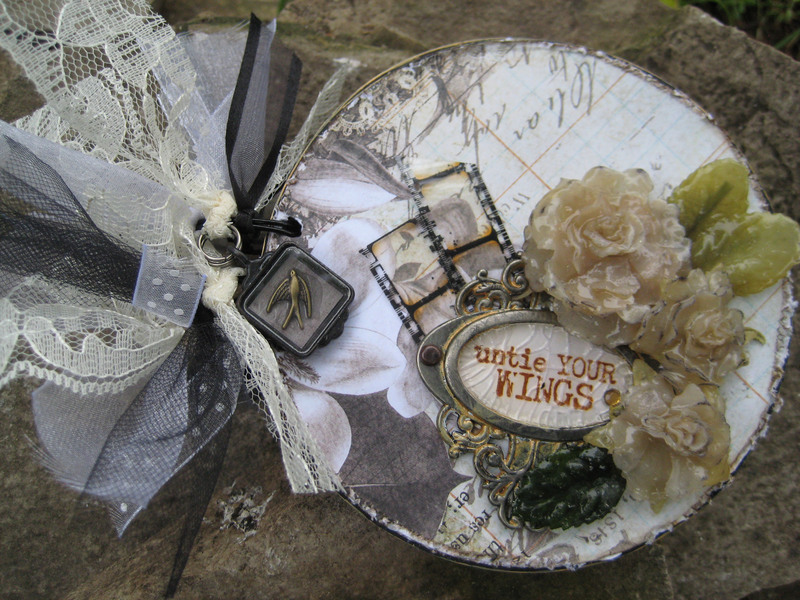 This class is coming up Saturday at Scrapbook Peddler in Saginaw. There are a few openings remaining and you can register by calling the store at (989) 497-2767. This new cd class uses a mix of beautiful papers from the Prima Nature Garden Collection and a coordinating Prima flower spray along with Prima’s Vintage Trinkets. You’ll cover each of the 10 pages with the Nature Garden Collection and along the way use a variety of techniques – including brushing with melted beeswax and creating porcelain-looking flowers by dipping them in melted UTEE. We’ll have lots of fun in this one! What a wonderful class. Had a wonderful time. Thank you Linda. Can’t wait to another class with you. Thank you so much for attending. So glad everyone enjoyed the class; it was such a wonderful collection of students! I really enjoyed it as well. Hi Linda, was wondering if you could tell me where to find the picture of the bird we used in your CD class? I want to make my mom one and love how that picture turned out with the beeswax. Beautiful, Linda! Love the crackle on that funkie sentiment. Thanks marjie! That’s actually Crackle Accents – something I hadn’t used in ages because of Crackle Paint but I really like the way it cracked. The sentiment is part of a stamp from Red Lead. I love this book and the new look of your blog, too! Thanks for noticing Candy! It needed to be updated and I figured it out all on my own! It took me till about 2 a.m. one night but I was determined! I’m very pleased with the book. It took several attempts but it finally came together – wait till you see the inside pages!